Add the oil to a wok or large pot. Sauté the onion for a few minutes without letting it brown. 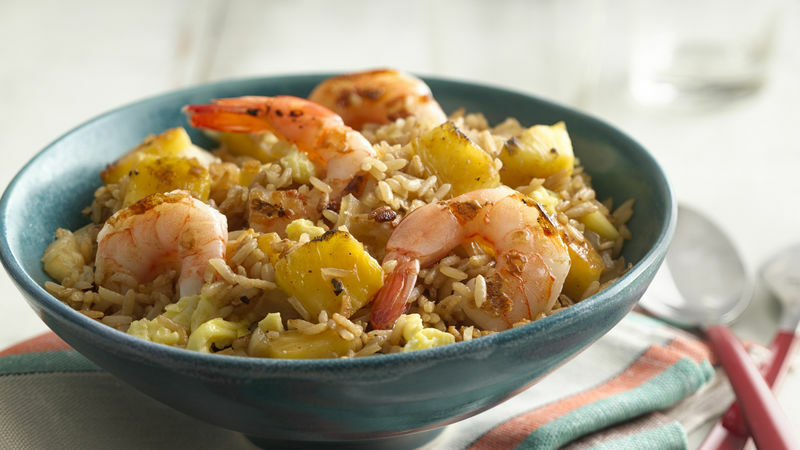 Add the pineapple and shrimp. Cook for 2 minutes only, without letting the ingredients get too gummy. Add the white rice and scrambled eggs. Mix all the ingredients well as you incorporate them into the wok. Pour in the soy sauce and mix well until you get that characteristic brownish color of fried rice. You can substitute shrimp for chunks of chicken or salmon, or you can prepare a vegetarian version of the dish. If you want, you can also add bean sprouts and smoked ham. This fried rice makes a great accompaniment to grilled chicken or BBQ ribs. Fried rice is one of those international foods that Puerto Ricans have adopted as our own. I prefer to make a homemade version that’s to my taste, and vary the ingredients according to what I have in the fridge or what my family likes.